“Usually when there is uncertainty about clinical treatment, you do not manage, but we continued to apply a transfusion,” says Dr. James Isbister, Royal North Shore Hospital, Australia. Now, a new study led by British doctors, there is no research showing that blood transfusion is beneficial, unless the patient is bleeding that can not be stopped. According to Dr. Gavin Murphy, of the Bristol Heart Institute, there are several studies warning of the dangers of blood transfusion. The study evaluated a number of other medical research have been published, showing that the problem is not with the widely publicized constrair risk of an infection, or diseases such as AIDS or hepatitis - the biggest problem is in their blood. Several of the studies reviewed show that blood transfusions, particularly those containing red blood cells, are linked to high mortality rates in patients who had a heart attack, which went through heart surgery and who are in critical condition. The exact nature of the connection between blood transfusion and high mortality rate is still uncertain, but the evidence points to chemical changes in the blood has aged, its impact on the immune system and the ability of the blood to transport oxygen. In fact, most experts now agree that the risk posed by blood transfusion is very much greater than the risk of an infection acquired during transfusion. “Will probably between 40 and 60 percent of blood transfusions are not good for patients,” says Dr. Bruce Spiess, Virginia Commonwealth University. Blood transfusions have become a staple of Medicine during the two world wars, when it was used as a last resort to save soldiers who had suffered massive loss of blood. But now, far from being restricted to catastrophic bleeding, transfusions are routinely used as a treatment option, most commonly in ICU patients or undergoing major surgery. Things began to change in 1999 when a study in Canada showed that significantly fewer patients died after the blood transfusion they received transfusion only when hemoglobin levels fell below 70 g / l of blood, and not 100 g / l, as is done normally. A more recent study found that in patients who suffered heart attacks, with hematocrit above 25%, a blood transfusion is associated with a risk of death three times higher or a second heart attack within 30 days. (Journal of the American Medical Association, vol 292, p 1555). For nearly 9,000 patients who underwent cardiac surgery in England between 1996 and 2003, receiving a red blood cell transfusion is associated with a threefold risk of dying within a year and a nearly six times greater risk of dying within 30 days after the surgery. Blood transfusions are also associated with more infections and higher rates of strokes, heart attacks and kidney failure - complications usually associated with a lack of oxygen in tissues. But people should not stop donating blood, scholars say. 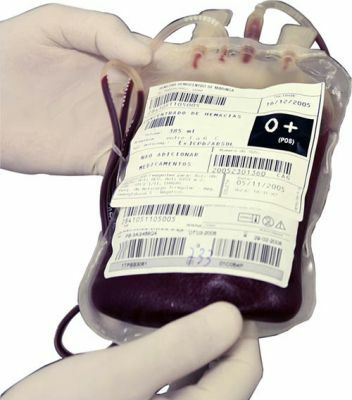 “Transfusion is critical in several situations, such as severe bleeding. We also need blood for essential products such as antibodies and clotting factors for hemophilia,” says Dr. Isbister.